PokerStars Live tournaments are run in accordance with the Poker Tournament Directors Association Rules (TDA) and guidelines. Click here to read the full TDA rules. The TDA rules shall be the prevailing version in the event of any discrepancy between the versions published on this web site regardless of language. Please Note: deviation from or addition to the current TDA rules has been highlighted below (in bold). Please read carefully. Tournament and satellite seats will be randomly assigned. A player starting in a wrong seat with a correct chip stack will move to the correct seat with his or her current total chip stack. Where applicable, players who collect their table and seat assignments will have their stacks put into play when all of their seat numbers have been sold. Example - If a player receives Table 4/Seat 8, once all the #8 seats have been sold, all of the #8 seats in the tournament will have their stacks put into play. 10-handed events seat 10, 9-handed and 8-handed events seat 9 and 7-handed and 6-handed events seat 7 at the final table. No final table should seat more than 10. This rule does not apply to heads-up events. Please Note: The following rules are unique to PokerStars Live events. Please read carefully. A: Enforcement options include verbal warnings, one or more “missed hand” or “missed round” penalties, elimination, disqualification and exclusion from all PokerStars Live Events. For missed rounds, the offender will miss one hand for every player (including him or her) at the table when the penalty is given multiplied by the number of penalty rounds. Repeat infractions are subject to escalating penalties but may not always be imposed in a sequential order of severity. Players should know any actions worthy of a penalty may result in a wide range of discipline even for a first offense. Players away from the table or on penalty may be anted or blinded out of a tournament. D: Chips of an eliminated player shall be removed from play and they will be eligible to receive prizemoney. Chips of a disqualified player shall be removed from play and they will be ineligible to receive prizemoney. E: Tournament Property – PokerStars Live Tournament chips have no cash value and are the exclusive property of PokerStars Live and may not be removed from the Tournament area(s) or the assigned event. Players found to be transferring chips from one event to another or from one player to another will be subject to penalties up to and including disqualification and exclusion from all PokerStars Live Events. F: Any individual who encounters inappropriate behaviour on the part of another individual should immediately contact the Tournament Staff. This shall include, but is not limited to, any player whose personal hygiene or health has become disruptive to the other players seated at their table. The determination as to whether an individual’s personal hygiene or health is disruptive to other players shall be determined by the Tournament Staff which may, in its discretion, implement sanctions upon any such player who refuses to remedy the situation in a manner satisfactory to PokerStars Live. G: Televised Feature Tables and Hole Cards – Players who enter a tournament that is a webcast or televised tournament, are required to cooperate with the filming personnel. This includes showing your hole cards to the card camera on the table. Failure to do so may result in a penalty. For the avoidance of doubt, the term Electronic Device includes, but is not limited to, the following devices, both known and unknown. Electronic Devices are not permitted to be placed on the playing surface, which includes any part of the poker table, at any time. Players are allowed to place items on the rail. 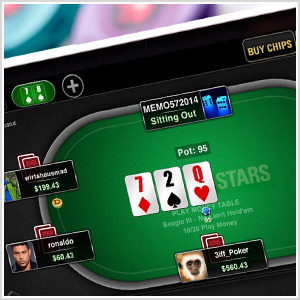 Phones, tablets and laptops - Players may use these devices (aside from taking calls) at the table, however not while in a hand. Periscope, Twitch, etc. - The use of Apps or any other type of broadcast capability to broadcast the tournament while in play is not allowed. There will be no electronic devices permitted on any Featured Televised Tables or Main Event Final Tables. Deals will be allowed in all venues where it does not conflict with local gaming regulations. All deals will be reported to media. PokerStars Live, together with the organising casino in which the Event will be held, reserve the right to cancel or alter any Event or Tournament at our sole and absolute discretion. PokerStars Live, together with the organising casino in which the Event will be held, reserve the right to cancel any Tournament which does not have a minimum of 10 players entered by the start of said Tournament. PokerStars Live, together with the organising casino in which the Event will be held, reserve the right to cancel any Guaranteed Prize Pool where player attendance at the tournament is affected as a result of acts, events, omissions or accidents beyond the reasonable control of PokerStars Live such as acts of God, including but not limited to fire, flood, earthquake, windstorm or other natural disaster; war, threat of or preparation for war, terrorist attack, civil war, civil commotion or riots; voluntary or mandatory compliance with any law (including a failure to grant any license or consent needed or any change in the law or interpretation of the law); fire, explosion or accidental damage; adverse weather conditions (e.g. Typhoon Warning of 8 or higher).